This 599cc 2-stroke DSI is the unmodified version of the engine that’s been launching Team Arctic down the racetrack since 2012. This quick-revving, 125-class horsepower C-TEC2™ power mill is the product of a world-class engine assembly plant — ours. 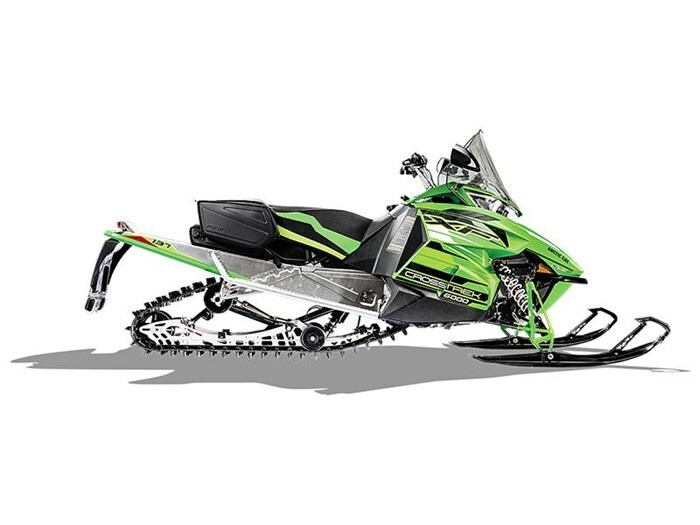 Whether you’re riding a ZR® an M or a Crossover, the 6000 is one of the most satisfying engines found in a snowmobile. The Arctic Drive System™ features a lightweight magnesium chaincase. The design incorporates a large TEAM® driven clutch and TEAM drive clutch. By eliminating belt skid, these clutches reduce temperature and transfer more power to the track. In addition to their incredible strength, these clutches are known for their easy and precise tuning. The Arctic Race front suspension’s geometry was developed through racing. Our unique wide A-arm spacing complements the chassis design, which allows us to maintain a tighter suspension. Arctic Cat gas IFP shocks feature a hard-anodized aluminum body, 0.5" shaft, aluminum internal floating piston, and high-quality seals and ice scrapers. For added strength, the eyelet on the shaft end is forged, replacing the welded design. The SLIDE-ACTION Rear Suspension brings race-day technology to everyday riding. Our U-shaped slot fits over a fixed shaft to allow a crucial half-inch of sliding movement. As the rear transfer blocks are engaged, the free-acting front arm follows the terrain, keeping your skis firmly planted over bumps, and during aggressive cornering and acceleration. This significant detail controls ski lift during acceleration. The Arctic Cat IFP gas shocks feature a hard-anodized aluminum body, 0.5" shaft, aluminum internal floating piston, and high-quality seals and ice scrapers. The information you need while riding, beautifully packaged. That’s the best way to describe this dual LCD gauge. There’s an odometer, trip meter, speedometer, engine hour, clock, fuel level indicator, battery voltage, coolant temperature, reverse and warning lights. The 137" Cobra track’s cupped lug design delivers superior handling, acceleration and braking in loose snow conditions. Its traction teeth add extra grip on hard-packed surfaces. The 1.6" paddles provide that extra traction needed in the deeper stuff. This trail ski’s 6" width delivers excellent handling on hardpack snow and good flotation in loose snow. A stiff, deep keel provides positive cornering in all conditions.